Olympus's entry-level DSLR gets an upgrade, but can it really compete with its latest rivals? For some, there's always been a question mark over Olympus's Four Thirds format. The sensor size is about half that of a conventional APS-C DSLR and so, the popular theory goes, the resolution will be lower and the noise will be higher. It's true that these were issues for earlier Four Thirds cameras, but Olympus has come a long way since then. We're used to big jumps in image quality coming from technical breakthroughs, but here it seems it's come through a long process of development. The bottom line is that the E-450's image quality is very close to that of a camera like the Nikon D60 or the Canon EOS 1000D, and that's without making any allowance for lenses. The 14-42mm zoom supplied with the E-450 happens to be very good, despite its low price and plastic mount, so the overall image quality, including aberrations, lens distortion and edge sharpness, is as good as that of any of its budget rivals. It also produces very clean and vivid images. This camera comes with just three of Olympus's new Art filters: Pin Hole, Pop Art and Soft Focus. The Pin Hole and Soft Focus filters are good, but the Pop Art effect is a bit garish. You get six art filters on the E-620, but apart from the Grainy Film filter, you're really not missing very much. That's because there's so much more to any camera than just its sensor, and the E-450 reminds you of this the moment you start to use it. It combines a super-compact body with perfectly weighted controls that have a particularly precise feel and sound. If you compare it to a Sony DSLR, for example, it's like going from a sports car to a tractor. Olympus's interactive interface is extremely efficient, too. All the camera's settings are displayed on the LCD on the back, and by pressing a button you can make them 'active'. You can then move around the settings using the directional buttons and spin the control dial to alter the values. In theory, you can operate Nikon's D60 and D5000 in the same way; in practice, Nikon's system is a little too cumbersome and slow. It's another reason why the E-450's handling is so efficient and enjoyable, but it's not the sort of thing that usually shows up on a specs sheet. The three-point AF sounds pretty primitive, but it works well enough, and actually it's quite refreshing to use such a simple system. You can see what the camera's doing straight away and you find yourself needing to override it less often than you might expect. The E-450 offers a different AF mechanism in its Live View mode, swapping to a more sophisticated contrast-detection system. It's also a lot slower. This is something DSLR makers don't seem to have properly got to grips with yet, so while this is okay for reasonably static subjects, it's not well-suited to grab shots. The metering system as a whole works well, though you have to watch out for highlight clipping. However, if you switch to the Live View mode and its histogram display, you can adjust the EV compensation to get the exposure just right. 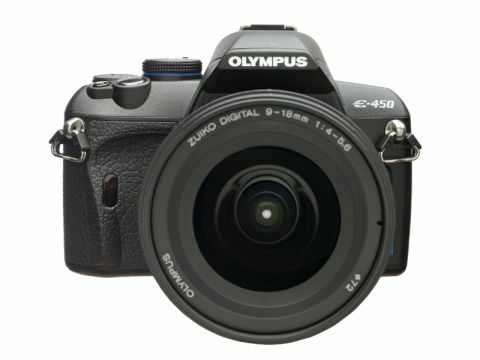 The E-450 also includes Olympus's usual Highlight and Shadow Spot metering modes. You can use these to 'peg' extreme highlight and shadow detail to ensure the camera records it. Although the E-450 is a budget model, it's not been dumbed down and keen photographers will find it gives them all the hands-on control they want, without burying the technicalities, and that's a large part of its charm.